The Super Bowl party is one of my favorite parties to plan. I don’ have to worry about my spread looking chic or whether my frosting’s peaks are stiff enough. All I need is nachos and wings. And beer. Lots of beer. Super Bowl guests are easy to please. But one thing you can do to make the day a little more fun (and possibly a lot more profitable) is play Squares. You might have seen this before. Basically, everyone “buys” squares on this board for a set price, usually somewhere between $1 and $5. You can buy one square or buy 10, it’s up to you. Everyone’s name goes in their square and their money goes in a jar. Once the board is filled up, you draw numbers 0 through 9 and write them in a random order at the top of each column, repeating the process for each row. Then you grab a brew and watch the game. Easy, right? At the end of each quarter, jot down the score. 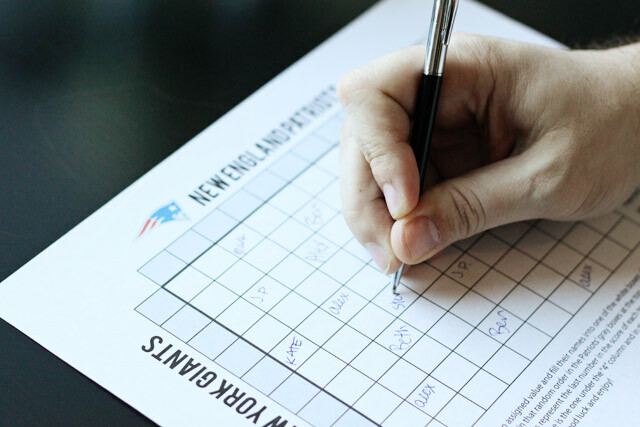 Match up the last digit of each team’s score with the corresponding column or row on the board. 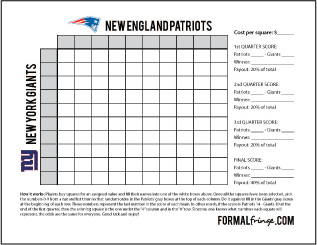 The person whose name is in the winning square at the end of each quarter gets a cut of the total. The person who bought the square that matched the final score gets an even bigger bit of cash to take home. Way better than a party favor. 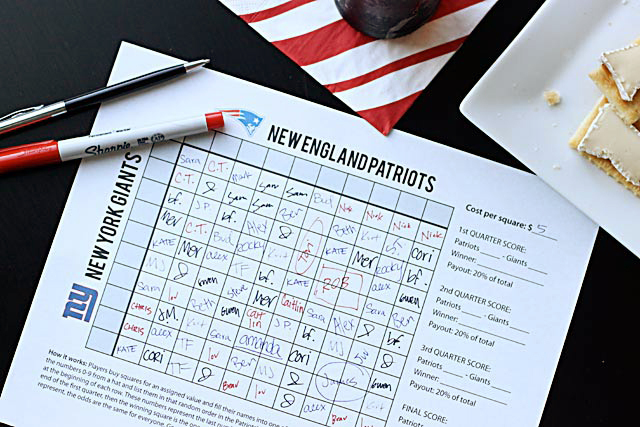 If you want to play with your guests this weekend, here’s a free printable Super Bowl Squares game sheet for you to print out at home. Good luck! Who are you rooting for in the Super Bowl this year? Thanks! This is the best one I found. Thanks! I’m glad you like it and I hope you won a little something, too! Can you make a new one for 2013? I love this one! Is there anyway you can add the numbers 1-100 on the squares? Love this game! Any chance you could do one for 2017? Thank you in advance for your help!